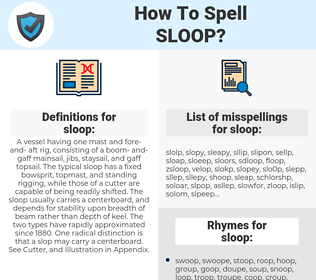 What are the misspellings for sloop? What are the common mistypes for sloop? What is the definition of sloop? What does the abbreviation sloop mean? What are the rhymes for sloop? What are the translations for sloop? 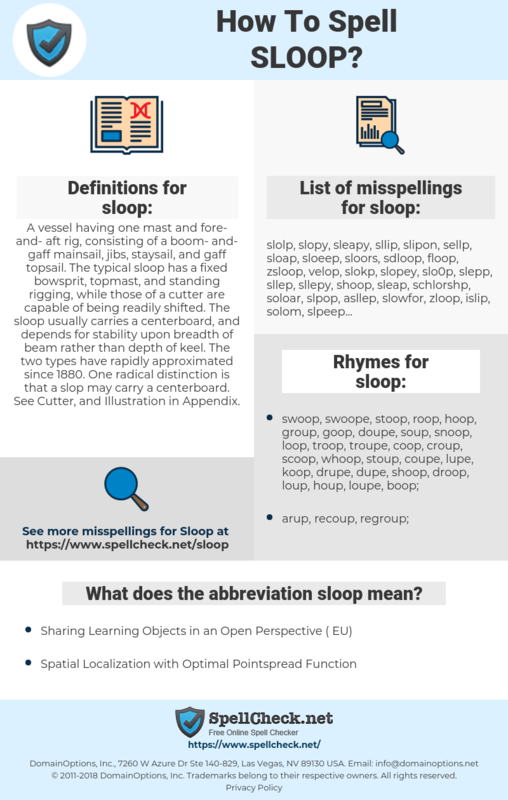 What are the common typos for sloop? A vessel having one mast and fore-and-aft rig, consisting of a boom-and-gaff mainsail, jibs, staysail, and gaff topsail. The typical sloop has a fixed bowsprit, topmast, and standing rigging, while those of a cutter are capable of being readily shifted. The sloop usually carries a centerboard, and depends for stability upon breadth of beam rather than depth of keel. The two types have rapidly approximated since 1880. One radical distinction is that a slop may carry a centerboard. See Cutter, and Illustration in Appendix. This graph shows how "sloop" have occurred between 1800 and 2008 in a corpus of English books. ஒற்றைப் பாய் மரம் கொண்ட கப்பல்.